An ethousiastic reader commented on an answer I provided about predictive technical analysis, saying that the win rate of Fibonacci and iterations of it such as de Mark have a win rate of around 40%. He said I was an idiot (true) but more importantly if it was the case, people would do the opposite and win (false). While I have rarely been accused of being intelligent, probabilities still do not work like that. This is an important point for people who develop systematic automated strategies: improving the trading edge comes from reducing false positives, or moving near wins (small losses) into near misses territory (small wins). The compounding effect of tilting the win rate and the average win has dramatic impact on the overall gain expectancy. 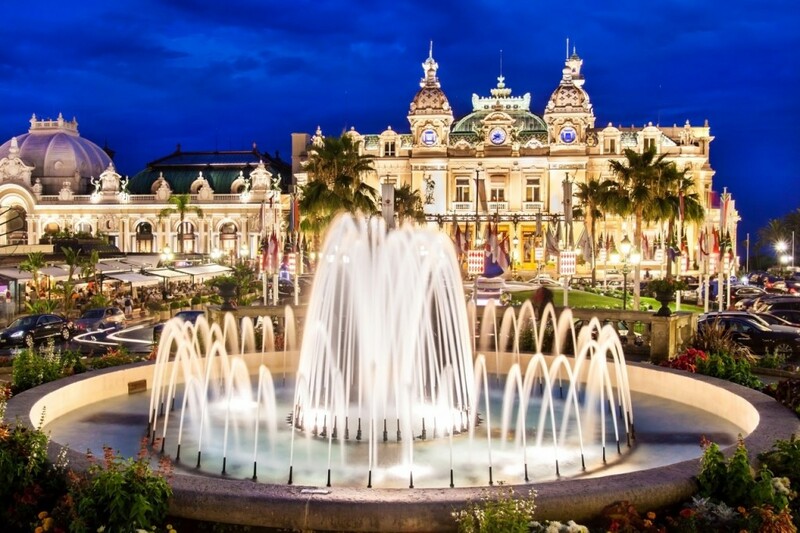 For example, in our strategy, we have introduced a lag in the stop loss, called “French Stop Loss”, because it is fashionably late “bien sur”. This gives additional wiggle rooms to each trade. They can mature and are rarely stopped out. Not all of them succeed however. Some are closed because trend reverts. This is far less costly than stop loss though as trend reversals occur around break even. The number of stop losses has come down by almost 3/4 and now trades are closed around the break even point. This has considerably reduced erosion and has allowed us to increase the number of pairs traded from 12 to 36. If most people lose in the stock market or gambling, then would I make money by doing the opposite of the average person? http://alphasecurecapital.com/wp-content/uploads/2015/03/logo-e1426537613238.png 0 0 lbernut http://alphasecurecapital.com/wp-content/uploads/2015/03/logo-e1426537613238.png lbernut2016-05-03 14:10:162016-05-04 00:34:34@Quora: If most people lose in the stock market or gambling, then would I make money by doing the opposite of the average person? My answer to How do i improve the sharpe ratio of my trading strategy? Reverse engineering Sharpe ratio is the trademark of some very large shops, with a large pension fund clientele… Like diet, it is simple in theory but not easy in practice. Collapse volatility: only one way to do it, collapse net exposure (Long -Short market value) to a band +/-10%. That is tantamount to market neutral. Few strategies can achieve this. How do i improve the sharpe ratio of my trading strategy? http://alphasecurecapital.com/wp-content/uploads/2015/03/logo-e1426537613238.png 0 0 lbernut http://alphasecurecapital.com/wp-content/uploads/2015/03/logo-e1426537613238.png lbernut2016-05-03 13:31:082016-05-03 14:06:00@Quora: How do i improve the sharpe ratio of my trading strategy? 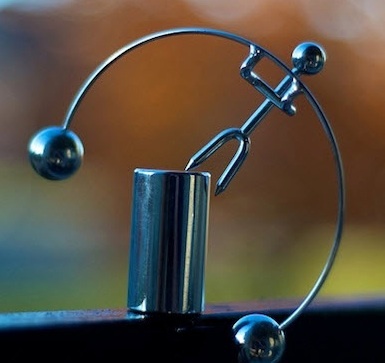 The mind plays tricks on us, even with a successful system, as a system trader, what methods to use for the mental part of the system trading? So meditation, journaling but how to implement them in one overall plan? You cannot trust your mind. Michael Gazzanikas 1964 split brain theory. Self-deception: (Daniel Goleman) is a built-in feature. It happens automatically and covers its own tracks and designed to deceive us. Accountability: simple exercise to test validity of prediction and convince us we are unable to predict. Walk through your fears: meditate and manifest your fears. Seneca was history’s first investment banker. He also happened to be the founder of stoicism school of philosophy. He advocated one day a month of living frugally as a form of inoculation. So far as a Trader what is the biggest fear that you have not been able to overcome? How do you manage this situation? Systematically take less risk: when making sizing arbitrage ask yourself, would You be satisfied with earning a little less than You could or losing a lot more than You should ? Tell us more about risk management, Volatility based Stops and position sizing. Volatility stops: swings +/- 3 ATR. Volatility is as welcome as Kanye West at an award ceremony. 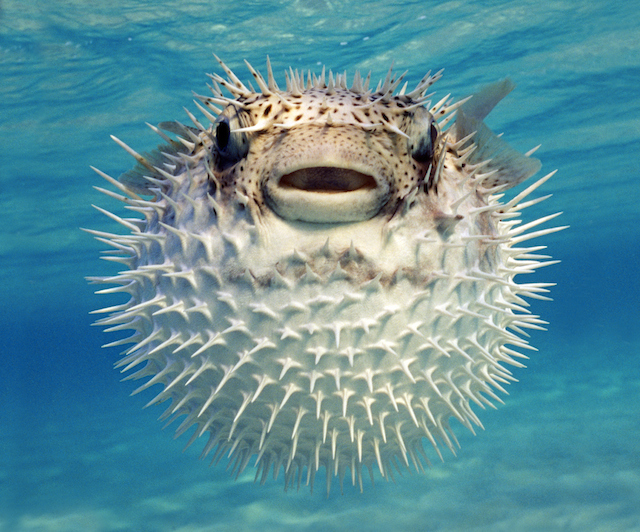 Bad news, volatility is like Monsieur Kardashian bad manners: it is here to stay. Your job is to ride it and the way to do so is position sizing. For example, biotech and internet stocks are more volatile than department stores for example. So, size them accordingly. I have been following your website ASC for quite some time and also your answers on quora. I have something related to an answer you had to a quora question In investments, does more risk really equal more return, in the long haul? Your answer immediately clicked with me and it logically made sense to me. Laurent – you may want to quickly summarize what the answer was before we move on to the next part of the question. I’ll ask you what the answer was. Would you please elaborate on your convex position sizing method for a risk per trade and draw down module. This was discussed as an answer on Quora. I understand that as you make money you will allocate a larger risk budget using a convex surface with a max risk budget of -0.30. But i do not understand the reverse side of this, the draw down part. As we get more draw down we should decrease our risk budget again using a convex surface. It starts at 100 and bottoms out at around 35. I do not understand how that part works. Also how did you come up with this method? Can you give a practical example of when you used this both for drawdown and additional risk scenarios? What are the 3 most successful triggers he uses in going short? Does he use daily or weekly charts? There were originally several variations on two strategies (mean reversion and trend following). Over time i have managed to merge them into one. Now, the delicate part is not in the signal module. Trading suspension for example is not a signal issue but a position size one. If sizes are too small, then trades are rejected. For example, sometimes currency pairs flip-flops between bull and bear. So, we count entries and add penalty for each full exit. This reduces risk per trade. If the overall equity is ain a drawdown, then position sizes get smaller. If they are too small, they are automatically rejected. This allows us to trade more pairs as some of them stop trading. How do you simulate borrowing costs when testing a shorting strategy? Everything at General Collateral (GC) +0,15% added to slippage. The question is probably related to hard to source issues or crowded shorts. 1) Majority of ideas for a short strategies seem to fail rigorous testing on larger time frames so one should focus on more active time frames [5min to 2H based data] instead of passive time frames [Daily to Monthly based data] ? Assumption: Nikhil may trade breakdowns, because this is a classic symptom or rebound higher than entry which leads to false positives. Solution is not in better entry signal, but in partial exit and better money management, Trading system has 3 components: exit/entry, money management and mental. 2) Can you highlight a basic idea on a short strategies variable for further research for those struggling with constructing a short only strategy ? Sure, check post on JNK attached. It is a scale-out/scale-in system. 3) What opportunities do you see in the financial industry going forward for new generation of entrepreneurs (non trading/investing related) coming up ? At the moment, everyone wants to be in the HF game. I entered the HF game in 2003 when it was still in infancy: a bunch of cowboys blowing stuff up in their kitchen. HF is bound for yet another healthy correction. 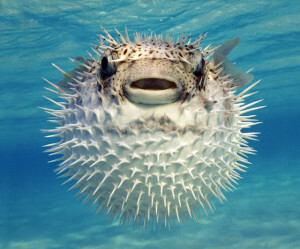 Active management “soft patch”: SPIVA.com. The overwhelming majority of funds underperform the index and they are more expensive than ETFs. There is a gambler’s fallacy going on: ETFs have outperformed active managers so far, but the latter will be better equipped to navigate volatility and downturns. That is gambler’s fallacy: if managers failed to outperform during easy times, why would they even succeed during hard times ? I am using market filters to keep me out of bear markets for my long only strategies for stocks, and I’m cashed up for periods of time. I find this a bit boring. What type of indicators or price action should I look for to create a short strategy to complement the long strategies? I’m looking for something simple and robust to be used on the daily time frame. Hello, it is often said that short trading is very difficult to make money off: Do you agree with this? If so, do you think it is a matter of the odds not being on your side or is it too much to handle mentally? EXCELLENT QUESTION: “This is space, the environment does not cooperate… You solve one problem after another, and if You solve enough problems, You get to come home”, The Martian. On the other end of the spectrum: is there an outer limit, odds-wise, for profitable long term trading, or is an 800-day breakout tougher to handle mentally than a 2 day breakout? 1) What works better in the forex market – momentum or mean reversion? Mean reversion works until trend following works. It is a question of periodicity and tolerance for stop loss. My strategy is a combination of both. 2) If you had to start over from the beginning with the knowledge you have now where would you focus on and what would you throw away? 3) You have said in the past to focus on exits and not entries – but how exactly do you do this? Is it a matter of thinking about when you will exit if you are right or wrong? Never think about right or wrong, it is the wrong mental association that will lead to death. Think about profitable. I am writing something on the psychology of stop loss. This article is potentially the most or second most important post I have ever written. The best analogy is diet. Diets don’t work. We are all getting fatter and there has never been as much information on diet. Diets fix the wrong thing. The problem is not what we eat. The problem is how we think about we eat. Same goes with stop loss and exit. This is not a mathematical problem. This is a psychological issue about the meaning we ascribe to closing positions. If we associate stop loss with being wrong, the ego will revolt. 5) Please talk more about stops. you said in the past your stops have a large impact on your P&L – but how do you calculate your stops. What are the considerations when using a mean reversion vs momentum strategy and type of market forex vs futures. Now, for mean reversion strategies, the equation includes another variable: frequency. Let me give You a simple example. If you clock +0.5% per month and then have -6% month, it will take roughly a year to make that back if everything else works. So, a simple idea is to empirically come up with a patience factor. Example: never allow losses to be greater than 4 months of average profit. The difficulty though is correlation. Accidents travel in group. I trade a long term trend following (trade every 1-3 months) system on stocks indices currencies and commodities. What type of exits would you use on this type of system? Trailing ATR stop? Time stop? Both? Partial trailing stop loss: take some money off the table so as to reduce risk, but leave a residual for the big trend. After taking some money off the table, it makes sense to re-enter and a add a little bit more risk. Time stop: buying power and trading frequency. Some stocks do not move enough to warrant either a stop loss or a risk reduction. These are the harder ones to spot. The solution is to timestamp them. There are two position sizes: too little or too much. Too little when it is working and too much when it is not. Of course, our inner idiot compels us to take too little risk when we should be bold and vice versa when we should be prudent. Position sizing is this critical juncture between financial and emotional capital. Deplete the former and it will take effort to rebuild. It is a complicated problem, but not a complex one. Break the latter and “Game Over”. If You have encountered “fear of pulling the trigger” or if You routinely take too much/too little risk at precisely the wrong time, then this position sizing algorithm might be for You. The first part of the journey was to find out why I consistently drifted from conventional algorithms. Volatility is elevated: that rules out systems like equal weight. Unprofitable trades balloon rapidly. So, the natural tendency is to be conservative and take small risks. Unlike the long side, there are no 2-3 baggers. Winners shrink and contribute less. So, there is an opposite tendency to oversize positions. Bottom line: the short side is less a stock picking contest than a position sizing exercise. Winners get smaller and loser get bigger. The difficulty is to size positions so that they contribute when successful, but do not torpedo performance when unsuccessful. There are two types of position sizing algorithms: aggressive or conservative. Risk seeking systems will have You bet beyond your comfort zone, and sometimes lose more than You should. System failure means cumulative losses have permanently damaged your ability to bounce back. Conservative systems will have You bet small and earn less than You could. Failure means returns are not attractive enough, and/or period of recovery after a big loss is too long. There are also two types of people when it comes to risk: risk seeking or risk adverse. Risk seeking people have higher tolerance for the volatility that comes with bold choices. If they go too far, they may no longer have the resources to bounce back. Risk adverse people accept underwhelming returns in exchange for low volatility. Their downfall is they are sometimes conservative to the point of being risk seeking. Failure does not mean they aim too high and miss their target. Failure means they aim too low and succeed. Now, the world is not Manichean. There are times when it is wise to be conservative, settle for a risk adverse system, accept to earn a little less than You could. There are also times when it pays off to be aggressive, ride a risk seeking system, but potentially lose a lot more than You should. The problem is that most position sizing algorithms are good at either one or the other. They are not equipped to transition smoothly from equity growth to capital preservation. A core principle is that systems must be followed throughout a cycle in order to achieve predicted results. The problem with many position sizing algorithms is not to find the optimal size that will achieve desired geometric returns. The difficulty is keeping executing through euphoria and depression. Of course, optimal f is the correct position sizing algorithm. The problem is my inner idiot thinks he knows better. For example, “fear of pulling the trigger” is simply the inner idiot (often referred to as amygdala) saying those bets are too big. This fear gets reinforced after every loss in the thalamus. It eventually gets to the point where the brain overrides the algorithm, but rationalises decisions. Self-deception is insidious, it covers its own tracks. I did not abandon any of the position sizing all at once. I just gradually drifted away. I failed because my inner idiot constantly second guessed what the algorithms suggested. Discipline is futile. It’s like diet: everyone puts those kilos back on in the end. I therefore realised that the only way to makes more sense to build a position sizing algorithm that the brain can embrace and then figure out the math. Convex position sizing algorithm was conceived backward. Math is subservient to the brain. It may not be the optimal mathematical solution, but it is one my inner idiot will have no problem executing during triumph and disaster. The best analogy is fuel efficiency. Flooring the accelerator and then slamming the brakes is not a fuel efficient way to drive. These are aggressive systems like Kelly criterion, optimal f and Fixed Ratio Position Sizing (FRPS). Driving like Mrs Daisy is lovely, but not necessarily the most competitive style. These are systems like constant Fixed Fractional Position Sizing (FFPS), equal weight. Convex position sizing algorithm runs at optimum acceleration. It will take on risk as equity curves rises and reduce as it comes down. It will slam the brakes to avert accidents and then re-accelerate smoothly. Risk Per Trade is the accelerator and Equity would be the brakes. One of the strengths of the algorithm is smooth transition from risk seeking to risk adverse. The algorithm focuses on drawdowns. As soon as there is a drawdown, risk is reduced. Conventional position sizing algorithms focus on winning streaks and thresholds. They are therefore slow to react. Most formulas focus exclusively on Risk Per Trade (RPT). With the notable exception of Market’s Money, few of them consider Equity (capital allocation or surface). The idea became clear to use both sides, one for acceleration, the other for deceleration. Risk per trade oscillates between a minimum and maximum. Trends mature, so risk per trade is reduced for each re-entry. Convexity comes from the ratio of min/max risk. In this example, min risk is set at -0.25% and max risk at -1%. The bigger the ratio the steeper the acceleration. Risk appetite: is not a mathematical number. It is the drawdown investors are willing to stomach before redeeming. Whatever You think that number is, divide it by 2. This is a clear case where You do not want to be right !!! 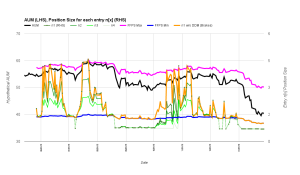 Risk appetite is one of the two input variable of the entire posSizer algo. Everything else is calculated. This is the equity allocated to each trade. The objective of this component is to absorb small daily volatility. As a drawdown becomes severe, surface is exponentially reduced so as to collapse residual risk. Note the slope of the curve. Small recovery results in rapid increase of the surface. Trading floor: this is the second input variable. This is a percentage of equity balance that will be allocated if drawdown exceeds tolerance. A good example here is Millennium partners. After a drawdown of 5%, equity is automatically reduced to 50% of initial capital. When investors say they can stomach a 20% drawdown, what they mean is they will think about redeeming after a 10% drawdown. 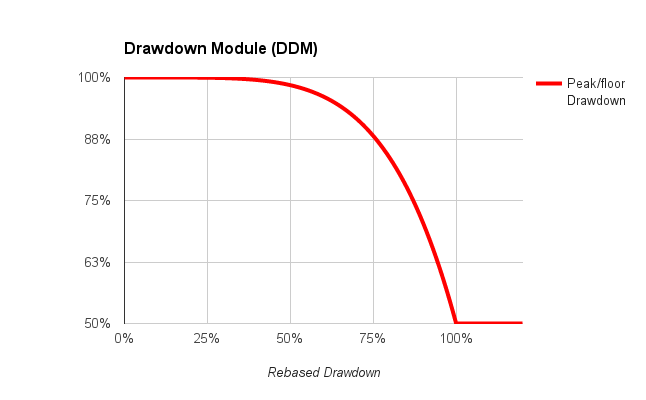 So, it is wise to cushion the blow with this drawdown module. This posSizer runs on auto-trade Metatrader MT4. We trade closer to 30 currency pairs, leveraged at 100:1 on 15 minutes periodicity. This is probably as aggressive as it can be. It feels like being in a driverless Formula 1, without a steering wheel, pedals for accelerator and brakes. Yet, thanks to this algo, there is no need to stay glued to a screen all day. This posSizer provides priceless comfort when most needed. It will smoothly handle trouble: reduce risk, collapse it if necessary and then re-accelerate rapidly. This is what it looks like in practice. Below is a hypothetical equity curve (GS stock price). The real equity curve does not have those big drawdowns, so it is harder to distinguish. Blue and pink lines are min and max market values per trade (MVPT). Green lines are market values for each position n1 to n4. Orange line is first entry without the drawdown module. As equity curve rises, MVPT rises in unison. MVPT reacts rapidly to each drawdown but still remains closer to the upper bound until a more pronounced drawdown happens. Risk is reduced for each new tranche. 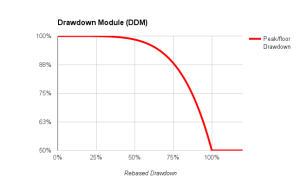 The drawdown module kicks in during severe drawdowns. This is the difference between the orange and green dotted line. MVPT goes down even further than minimum risk. There are times when even small positions seem too big. This ensures trades go through but at bare minimum risk. This reduces concentration, which in turn sets the stage for a rebound. One of the problems of FFPS is premature re-acceleration after a drawdown. This leads to whipsaw in sideways markets. This is again a potential reason to drift from suggested positions. After a severe drawdown, the orange line rises faster, while the dotted line adjust re-acceleration to the speed of recovery. For example, the first drop below min risk was followed by a prompt recovery. The second one was more gradual. Under extreme stress, every degree of freedom, every bit left to interpretation has the potential for costly human error. This morning Palermo time, Andrew Swanscott from Better System Trader podcast interviewed me. The above question came up. The answer is Yes and it is No, the real question is when. Best analogy is driving, will driving faster get You to destination: Yes when on the highway but No when in downtown. How can positions be sized so that they would contribute but not hurt ? This is probably one of the tallest order in fund management. People perceive risk as either static, as in constant or completely random. 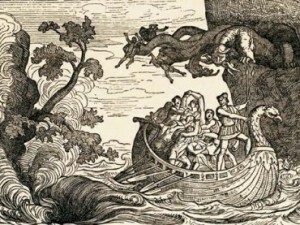 The perilous trip of the ship of Ulysses between Scylla and Charybdis. Well, it is somewhere in between and it depends on how You trade risk in the first place. It reflects back on the concept of open versus closed risk. Open risk is the tropism of mean reversion strategy. Everything hums fine until the big iceberg. Closed risk means risk is capped. Your view of the world will shape your risk profile. If You run an open risk model then because of its inherent unpredictability You are condemned to run it at low risk ad perpetuitam. If You run a closed risk, then You can accelerate and decelerate within the bounds of your risk tolerance. This is one of the most profound discoveries I made in 2015. there are two types of people when it comes to sizing a bet: those who take risks and sometimes get hurt along the way and the risk adverse crowd who will consistently take minimal risk. I think this relates to the essence of the question: Can I build a system that preserves capital when strategy does not work but takes risk when it does. Laurent Bernut’s answer to What are the best risk management practices for high-frequency strategies? When good times roll over, risk per trade is extremely responsive: brings risk to minimum right away. When the sh*** hits the fan, everything goes into Guantanamo, but it can still trade and thereby reboot itself. I am sorry if i came across as boasting this position sizing algorithm. The point was that nothing is static. The answer You are looking for is in your position sizing algorithm. In the end, ask yourself this question every time You think about sizing a position: can I live with earning a little less than I could or lose a lot more than I should ? http://alphasecurecapital.com/wp-content/uploads/2015/03/logo-e1426537613238.png 0 0 lbernut http://alphasecurecapital.com/wp-content/uploads/2015/03/logo-e1426537613238.png lbernut2016-02-29 09:38:442016-02-29 13:57:55In investments, does more risk really equal more return, in the long haul? Chinese IPOs: Institutional and some retail investors participate in IPOs. 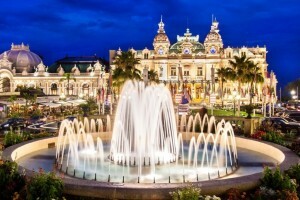 Classic trade is to sell half to 100% of the allocation at the Open of the first day and book the disount. Chinese IPOs used to go up 100% in 3-4 days. That “edge: is clearly gone now that they open 50% below and that “investors”/flippers have to keep their holdings for a certain period. Stock split: there was a strange loophole in Japan, where stock split were announced 2 weeks before effective dates. So, the trade was to go Long prior, reverse the trade and go short at the close of the day before the split went ex-date. In Korea, foreign participants had to trade in USD, while locals were allowed to trade in KRW. And then You wonder why some markets never seem to go anywhere ? Borrow availability was vastly different. Foreigners were not allowed to trade A shares. Locals in China and Korea were legally able to milk foreigners. This had nothing to do with talent. Arguably, it might have encouraged complacency. This is systemic edge. Another example of systemic edge is Ali Baba. There is no real competition from other shopping malls. Those edge exist as long as regulatory inefficiencies are there to protect them. They are fragile, fickle but can last for some time. They sometimes can be double edged. In their panic moves to contain the fall, Chinese authorities have asked some brokers like CITIC to engage in price stabilisation activities. Some people know how to trade GARP (growth at reasonable price). Some know how to trade value. Others know how to ride Beta. Their edge last as long as markets reward their style. Unfortunately, investors find it difficult to distinguish between skill and style. In other words, are managers good (or bad) because of what the markets reward (or punishes), or are they good because they adapted to what the markets reward. There has been a lot research on the topic. Quants sometimes refer to this as luck versus skill. A simple, down to earth trick to find out is: how do those managers fare when market style changes ? Does their performance suffer much more than the markets or can they contain losses ? The rarest form of edge and the least talked about is sustainable edge. The reason why few people talk about it is because either deep down they know they do not have anything special, or they believe their outer game constitute sufficient sustainable edge. For example, biotech analysts clocking 2-3 baggers one after another was great until a presidential candidate stopped being supportive of the industry. Unfortunately, no bull market has ever boosted anybody’s IQ. III. So, how do we measure trading edge ? Where do we find examples and can it be replicated ? This is also known as gain expectancy. This is just another fancy way to say average profit. This immediately eliminates discretionary fundamental investing. Everyone in the fundamental analysis business likes to make reference to Warren Buffet. Yet, very few have a comparable performance. I do not hate fundamental analysis, quite the opposite in fact. A good analogy is rock n’ roll. ELVIS and Ted Nugent are both rockers. Yet, no-one would ever dare putting The KING and that trigger happy human evolutionary challenged specimen in the same basket. I wish I could say Value investing has some sustainable edge. Unfortunately, like fundamental analysis, the word has been perverted and used by everyone with a marketing pamphlet. There is evidence of sustainable edge in systematic value investing. C. Can it be replicated ? This is probably the most important question. No-one really cares about their neighbor trading edge. What they really want to know is: how can i develop my own trading edge ? This is where the conversation takes on a different perspective. There are only two types of edge: specific and general. Systemic, stylistic/cyclical edges are specific. They focus on a particular edge over the rest of the competition. “Stock pickers” focus on getting this or that particular stock “right”. This is extremely specific. General edge on the other hand is about making sure the above formula has a positive sign before the number. The reason why CTAs have a sustainable replicable edge is not because they pick better stocks. They are not trying to be right on their view about lean hogs or German bunds. They trade the same asset class across various markets. That asset class is called risk. It has a number attached to it. They can maintain a sustainable edge not because they try to be specifically right, but because they choose to remain generally right. In other words, this is outcome versus process thinking. Process can be formalised and quantified. As the great motivational speaker Jack Welch used to say: everything that can be quantified can be improved. D. How to improve your edge ? Very few market participants have the courage to keep an honest record of their past trades. We are our trading history. For example, my trading history is part of my every day position sizing. How i size my positions today is conditioned by how well past trades have performed. If they perform poorly, then I should trade smaller so as to preserve both financial and emotional capital. The first is to build a P&L distribution of your trades and find your style. There are only two types. Please look at my blog about mean reversion and trend following. Know and understand your style. It is great to be the best figure skater, but August tends to be a bit dull. The simplest way to improve your edge is to limit drawdowns when your style goes out of favor. Remember this very simple truth: profits look big only to the extent that losses are kept small. hardly rocket surgery, isn’t it ? This one goes against mainstream that encourages You to take risk when it works. The problem with this is how much is enough ? Kahneman says we suffer from chronic overconfidence. That means we take too much risk and then get humbled. So, my suggestion is not to take on more risk when it works. My suggestion is to take less risk when it does not.